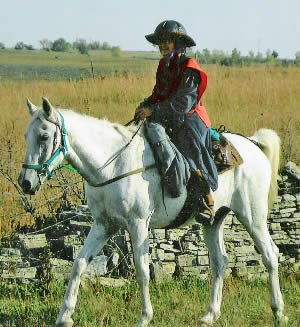 Endurance.Net: USA News: 37 Year Old Elmer Bandit with 20,710 Miles!! I knew Mary Anna Wood as many young girls did-as "Kelpie" the director of "Saddle Straddle" at Girl Scout National Center West. I was in the last group to go through the program in the summer of 1989. At the time her leg was broken if I remember right thanks to another horse named "Beaver". Elmer was there too and was a special horse to the counselors there...If only I had known just how special he was! If anyone gets a chance to talk to her please tell her that Kathy from NY would like to thank her for some of the greatest horse memories of her life! The only thing that tops that time is taking my two kids trail riding with me now!